Click for bigger. Just imagine them moving around really frantically. This entry was posted on 9:01 AM You can follow any responses to this entry through the RSS 2.0 feed. You can leave a response, or trackback from your own site. I am so glad you got a picture of this! It is so perfect! by the way, y'all's blog cracks me up! I love this photo. 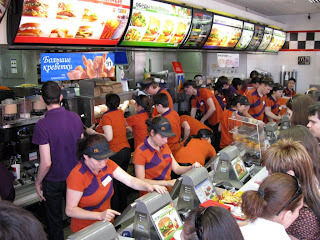 I wish this many people worked at the American McDonalds. Is it really busy enough to need that many people? that is crazy but I like it!